If you’ve made it here, you’ve no doubt figured out—“this guy is writing a book about…” Well, what is this book about? With the Affordable Care Act taking effect later this year, we are all very focused on trying to help consumers understand the confusing world of health insurance and to help educate and drive them to make better-informed healthcare decisions (e.g., taking better care of their health, going to Urgent Care vs. the ER if it’s not a true emergency, choosing a generic over a brand-name drug, etc.). So how do you help someone understand— truly grok—something as complex as health care options? How does one move from that place of bewilderment to the sudden “I get it!” point of enlightenment? At this moment, I’m interested in the connection between play and learning. How, when you start to play with something—especially a concise representation of a difficult concept—pattern recognition sets in. We learn through playful, visual (and spatial and…) interactions. Yes, interactive visualizations will be a focus of this book, but I’m more interested in exploring how things like vision, spatial memory, or physical interactions contribute to sense making. 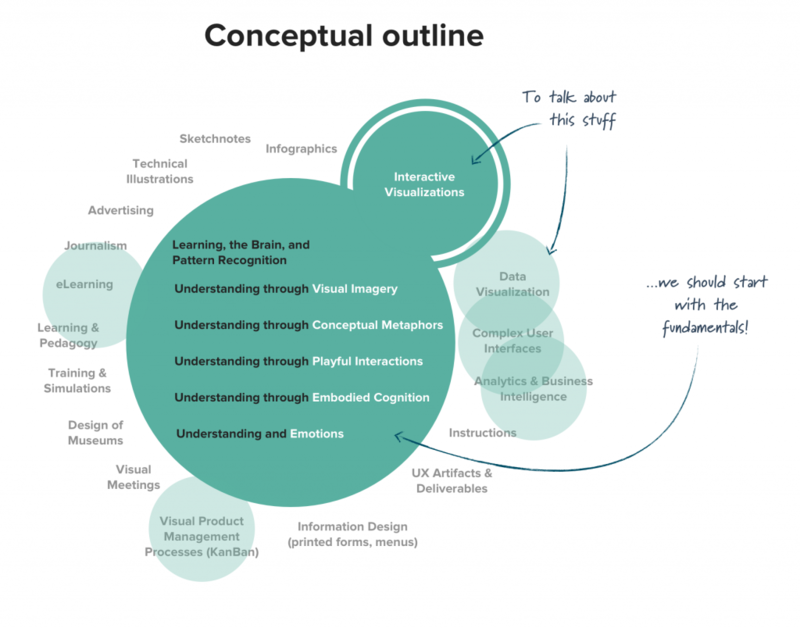 Basically, how do we get from “I don’t understand…” to “This finally makes sense!” How do we get from information to understanding? I’m thrilled to be writing this book. I’m thrilled to be writing this book with Rosenfeld Media, a publisher very invested in the writing process and production some of the highest quality books in my library. I’m thrilled by the writing team forming around this book (I can’t wait to tell you about some of the truly stellar people who have agreed to help me with this book). And finally, I’m thrilled to be writing this book with you. Yes, you. While there is much I’ve already learned, I’m more excited by all that I will learn by sharing as much a possible along the way.